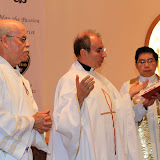 From the time of his appointment as vocation director for the province, Father Ramón Gaitán, O.A.R., has made splendid progress in laying the foundation for real vocation recruitment. Under his direction and with able help from both the Saint Augustine Priory and Mary Star of the Sea Parish communities in Oxnard, California, a highly successful vocation retreat was conducted in January of this year for young men interested in the religious life. Twelve young men, representing the parishes of Our Lady of the Pillar and Our Lady of Guadalupe in Santa Ana, California, and Mary Star of the Sea in Oxnard, California, were in attendance at the retreat. By all accounts the retreat was highly successful. Additional retreats are planned for the near future. The dates for these retreats will be communicated to the different houses of the province.